Oh, I am deep into cookie making lately. One little gingersnap danced through my kitchen and led me down the path to citrus heaven! Over at the farm site, you’ll find a new rendition of my old favorite Lemon Spice Cookie – this one made for lazy days and an easy sweet treat. It’s another GOTTA HAVE IT for your cookie repertoire! You can find the new simplified the recipe on my other site – DRIFTLESS DIRT. Click the photo above or link to the left to check it out! I guess that Ginger that snapped and danced needed a partner! Feeling like your holiday cookies need a little updo? 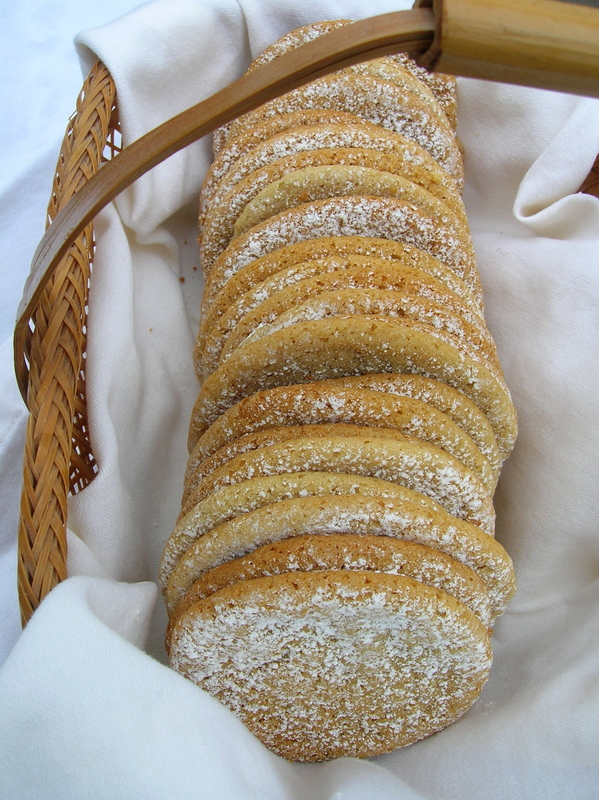 This lemony ginger spice cookie may just be what you are looking for! This cookie’s chew is addicting, the flavors fresh and intriguing, and oh so perfect for the holiday tray with a little dusting of snowy white confectioner’s sugar. If you’re like me and hardly ever bake because you can’t live with the temptation, this is the perfect cookie. These cuties don’t last long if anyone else is around. I originally posted this recipe a couple of years ago when lemons filled my mind for days. Lemons are enticing, but what caused this recipe creation was not only the idea of lemons, but a divine Indian dish with coriander…hinting of lemon! Sometimes obsession and distraction make for a happy child. A sudden urge for a really good chewy cookie and voila was born the lemon spice cookie recipe that had been floating around in my head. When the idea hit me, I knew I would base the recipe on my childhood favorite chewy gingersnap recipe from The Joy of Cooking, but with lemony spices instead of molasses and cloves. I would use lemon zest, lemon grass, ground coriander and ground ginger. To lighten the color of the cookie, I replaced the molasses with honey. I was hoping for the crinkle effect of a gingersnap, but for some scientific reason, that did not occur. Does anyone know why not? I used baking soda and vinegar…doesn’t mixing these two cause the chemical reaction needed to make cracks in the cookie…or is molasses involved? I’ll include the original gingersnap recipe below as well. If you love chewy cookies, it’s an amazing recipe. Cream together the butter and sugar. Add all the other ingredients except the flour and mix well using a hand or stand mixer. The last step is to add the flour and mix together well. Form dough into 1-inch balls. Bake on a cookie sheet for 12-15 minutes. When the cookies cool, cover them with sifted powdered sugar. Mix ingredients until blended. Form dough into 3/4 inch balls. Roll the balls in sugar. Bake on a greased cookie sheet about 12-15 minutes. Last year I made sauerkraut in August, and because it was so warm out, I decided to only let it ferment for one week (Not sure that’s logical, really!) Then being completely lazy the day I decided it was done, I packed it in 1 quart Mason jars, and FROZE it! That’s right, I threw the jars in the freezer, and let me tell you, this made the BEST sauerkraut ever. By freezing it the kraut tastes fresh, keeps a nice color and doesn’t get that indescribable “bleh” taste and texture of canned kraut. Here’s the coolest thing – when you take it out of the freezer to defrost, you can watch it begin to ferment again! It’s just a little bit fizzy and effervescent for the first few days – beautiful! To answer your question after looking at these pictures, yes, I freeze a lot of food in canning jars. A few years ago I started putting all my tomatoes, salsas, pasta and pizza sauce, chimichurri, banana ice cream…really anything that fits in a jar makes a good candidate for freezing in jars. And, NO they DO NOT BREAK as long as you don’t overfill them or bang them around! I stack them as you can see – safe and sound. So, haul out your giant food processor, grab as many cabbages as you want to make into kraut, put in the slicer attachment to any thickness you like, dump the stuff in a fermentation vessel or big bowl, and sprinkle with salt. For every cabbage use about 1 TABLESPOON of salt. Mix the salt into the cabbage well using your bare hands, gloved hands or a big set of tongs – whatever fits your comfort zone. Then all you do is cover it well, leave it in a dark place for a week and pack in jars for the freezer. How do you cover it while fermenting? That is a BIG discussion in the world of fermentation and everything seems to be pesky, but it doesn’t need to be. Some fermentation vessels have ceramic discs made just for the sole purpose of pushing down the fermenting veg to help keep it under the brine, others have lids that have a liquid seal, and some have both. If you are budget minded, or simply don’t want to invest in a big heavy crock, there are alternatives. One method to make fermented veg is to use a big bowl with a plate on top. It’s great if the plate fits down inside the bowl just a little, but not imperative. Some of your veg is going to float to the top of the brine and that is okay. With a week of fermenting and salt to protect it, you won’t have any weird stuff growing other than the weird stuff we want! If you do leave sauerkraut to ferment in a cool place for longer than a week, you might see a little harmless white mold grow. The pros say to just scrape it off. Eww! I’m a little squeemish about that idea, so I prefer to get the fermenting done before any molds grow! Another great way to submerse the bulk of your veg is to use large pieces of the veg you are fermenting as weights. So, if you are making sauerkraut, keep some of the large outer cabbage leaves to use as a protective cover under your plate. Or, if you want to weight it down, cut out the core of the cabbage and lay those on the top. Regardless, cover the veg the best you can so that it is submerged under the brine. I like to add a plastic bag over the top if the fermented veg is in a bowl as some veggies, like cabbage and radishes, can get a little pungent after a couple of days. Farm Curious gives some great budget-minded tips for other ways to ferment and protect your veg. I splurged a couple years ago on a fermenting crock from Poland – it’s fat and heavy! Since owning the farm it has been great fun because it holds A LOT of veg. I can pack 25 heads of cabbage into this baby! Of course, I have trouble eating that much sauerkraut, but it is fun to make. As you can see from the red cabbage, this year’s sauerkraut is going to be PINK! Right before it went into the oven – I forgot to take a picture when it came out! Another zucchini hanging out looking cute in your kitchen, but all your stand-by zucchini recipes exhausted? Well, here’s a great dinner crowd idea that is sure to please – and it is really easy. I have two bread puddings in my life: one is the stuffing that my aunt, Susy makes for Thanksgiving every year and the other is a sweet bread pudding that I experienced then recreated after taking our son to King’s Island in Kentucky one summer. The sweet bread pudding is a dense, eggy spiced dish with a rich caramelized bourbon topping – very simple, but decadent and satisfying. The bread and eggs prevent me from allowing frequent visits to my kitchen – in fact, it has been years now since I’ve made it. My aunt’s stuffing does not have eggs and it has always been my favorite dish on the Thanksgiving table. She sautées onions, garlic and celery, tosses in a few toasted walnuts and sage and mixes dry bread with a bit of vegetable stock. Seasoned with a bit of salt and pepper this concoction is pushed down into a baking dish to develop a thick crust around the edges. It is simple, and absolutely delicious! So, with bread pudding on my mind, and an extra loaf of bread from the Smiling Pelican Bakeshop in Maiden Rock, I began the search for a new late summer recipe idea to help manage the glut of tomatoes and zucchini in the garden. Roasting some tomatoes to decorate the top became first priority. But, if you try this recipe, don’t use foil on the baking pan like I did! I had a piece leftover that was covering something, so I thought I’d just recycle it – I wished I had used my Silpat instead, but I still made it work. These tomatoes were sliced thick, drizzled with olive oil, sprinkled with a titch of salt and impaled with a smashed piece of garlic before roasting. The filling that is mixed with the bread includes sautéed onions, garlic, basil, a grated zucchini and three medium tomatoes chopped. I seasoned with salt and pepper. This was mixed with cubed bread, spooned into a covered baking dish, topped with the roasted tomatoes to make it cute and baked at 400 degrees for an hour and a half. I took the lid off the baking dish after about an hour. Truly easy. Truly delicious! This is also a great dish to make ahead and freeze for later baking! I made this two days before the meal – just threw the covered casserole into a plastic bag. The day I needed it, it went straight into the oven. Heat oven to 400 degrees. Slice fresh tomatoes, lay them out on a cookie sheet, drizzle with oil and salt. Flip them and drizzle again with oil and push into the middle of each about a third of a smashed piece of garlic. Roast until the edges begin to caramelize. Saute diced onions in a bit of olive oil until translucent then add 3-4 minced garlic cloves. Cook for a minute or so just until the garlic becomes fragrant. Turn off the heat. Then add the diced tomatoes, grated zucchini, basil, bread cubes and salt/pepper. Once all the ingredients are well mixed, pout it into a covered casserole baking dish, push the pudding down, top with the roasted tomatoes in a decorative fashion. Bake for one hour covered, remove the lid and bake for another 30 minutes uncovered. Are you in a battle against weeds? A lot of the articles I have read about weeds argue it is important to know what kinds of weeds you have in order to effectively control or combat them. But I would also argue that it is important to understand why they are in your garden in the first place. Their presence tells a story, and I have come to learn that they cannot be beat. We must join them! Since owning this farm, I have learned a lot about weeds, how to manage them and how to get completely bamboozled by the little stinkers! Weeds in the country are brawny and bold. They will not stop or pause for much. I have come to understand why it is that farmers use herbicides, because stopping a weed from doing its job is next to impossible. That’s right, weeds have work requirements, and contrary to popular belief, their main duty is not to aggravate humans! I try to empathize! Weeds do a great job protecting our top soil from eroding. Weeds spread low and wide often to do this. Other weeds send down long tap roots to bring minerals up out of the soil, and some weeds deliver nitrogen to nearby plants. And we all know, bees love their flowers! Here we see the spread of dandelion, crab grass, clover and chick weed all working together to cover unprotected soil. Of course, my vegetables have a hard time growing with too many weeds as neighbors, so I do have to work at taming them. When we first moved here, our first line of defense against the weeds was the mower. Mowers are very handy machines that are quite effective at keeping weeds at bay. Continuously cutting them back often causes their demise. If not complete death, they are at least stunted or camouflaged as lawn. Weeds in the gravel driveway! This Spring was early which gave the weeds a jumpstart. By June my gravel driveway was completely invaded with weeds that had nestled in between the small rocks and set roots. What do you do, weed your driveway? I figured there must be an ecological perspective about how to manage this problem. I need the driveway to give support to the cars or they would squish down in the soil when it rains. In my quest for an answer, I read an article about seeding runways in Alaska with fescue. That seemed to be the answer to my problem. I seeded the driveway and now mow it very short. It hasn’t completely filled in yet, but it actually looks very nice – a little hard to find the driveway from the road – but visually attractive. The weeds can still be on the driveway, but they will be camouflaged by grass. I can live with that. Driveway after seeding (first year). But what do you do about the weeds that are in the cracks, under trees and in other hard to reach places? Well, in the city a layer of landscape fabric and 4-6 inches of mulch usually does the trick. Out here, that’s laughable! I found out the hard way that weeds in the country simply pop right up out of landscape fabric no matter the thickness or industrial strength. Mulch also poses a problem in that its little crevices are the perfect place for all the airborne seeds to land. One year after mulching in the country, you will likely find a whole slew of dandelions, burdock, thistle or crab grass just to name a few. Mulch is really just compost feeding any happy seed trying to grow in it. It seems to me that anything that will cover and fill in quickly is key. Our farmhouse gardens have these plants growing like living mulch and they do a great job making the landscape look attractive and weed free. White blossoms, loves shade, doesn’t spread overly quickly…no idea what it is. No idea what this is called. Violets cover the perennial bed between Lilacs and Mock Orange bushes. This stuff looks like Queen Anne’s Lace when blooming in June, but it’s low-growing and does not have a tap root like the wild carrot. Anybody know? In my quest for weed management, I also learned about energy displacement. Take burdock for example. Burdock sends down a deep tap root and foliage that resembles rhubarb. If you let it grow, in the late summer it has spiny little flowers with a pinkish purple hue. These lovely spiny flowers dry out and become the burrs that cling to your dog’s fur as they run for a stick. But, if you know how burdock grows, you will know that it takes two years to flower. The first year it spends its time making a huge tap root and lovely foliage. The second year the root grows again and by mid summer, it will send up a shoot where the seed heads will form. If you cut it right around the time it is trying to seed, you kill its energy supply. You can also effectively kill it by chopping burdock off just below the surface of the soil – basically slicing the top off the tap root. The last week in June or first week in July has jokingly been dubbed, “Burdock Eradication Week.” I spend the week with a sharp shovel or edger jabbing the huge foliage leaves off the root. I have not completely eradicated the burdock from my property, but with careful management like this it is doable. Cutting back the burdock provides a huge nitrogen supply for my compost! Thistles on the other hand! What the heck! I get that these guys are 1) prolific, 2) tenacious and 3) bringing minerals to the surface, but they will beat you off if you move into their house! Thistles in mass where potatoes once grew. This area has raised beds with at least four inches of straw to cover. We laid industrial grade landscape fabric under six inches of wood chips last year. This year, thistle mass despite black plastic! The LOST Garden – completely overrun with amaranth and thistle. And, I apparently moved into their house. Last year we built our second permanent raised bed circle garden and enjoyed one year of perfection. The garden was a beautiful addition to the property and I had lots of fun with the extra space. This year, however, is another story. Our warm winter, very little snowfall and early spring allowed for the weed seeds to get a head start, and the thistles celebrated! Last year I kept them smothered in straw, green manure and garden plants. This year they had a homecoming party before I even got into my galoshes to check out the gardens. I tried in vain to pluck them into submission, but by the end of June I had to quit. I shut the gate on their house and will not return until next year with a new strategy in my back pocket. These guys need the old-fashioned till and dry treatment first. I’m thinking constant cultivation will help sprout, dry and kill a few of these buggers. Then I’m hoping buckwheat as a cover crop and its allelopathic tendencies will help prevent lots of seeds from germinating. To help keep the soil covered and not invite a new crew of weeds, I will till in the buckwheat and seed with winter rye. That will help smother out the little rascals in the fall and spring. Once that gets tilled in, I will have the added benefit of improved soil. I may even repeat the whole process again with another round of buckwheat and rye before I even consider planting another vegetable garden in that spot. Don’t I sound smart! Watch for future “eat crow” episodes where I again honor the weed! Any suggestions besides, “Hey, Sarah! Use Roundup!” are welcome. So, what have I learned about living in the country? First, I have learned a little about how to manage weeds, and that there is a whole lot I don’t know! More importantly, I have learned to find ways to live with them. It seems that understanding their purpose has helped me feel better about coexisting.